On a Sunday morning in the village of Sinfra, about an hour and fifteen minutes from where we live in Yamoussoukro, people sit shoulder-to-shoulder on backless wooden benches at the local Church of God. 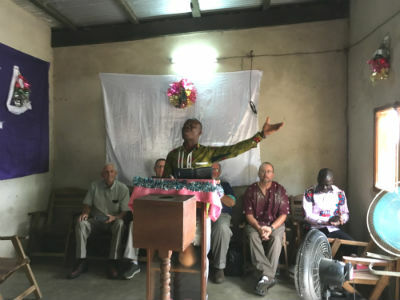 The church has been meeting in the living room area of the house that was built for the pastor, although they outgrew the space some time ago. During the last two weeks of August, a team of eight people from Minnesota and Georgia came to work alongside the local congregation at Sinfra to help construct a new church building, which will give the church more space to worship and continue to grow. Jeff Vaneps led the team, made up of three families: Ernie, Jason, and Ryan Knoll (three generations! ); Dave and Nate Chaffin; and Tommy and Darlyne Mathewes. Each team member from the U.S. was paired with a prayer partner from the Sinfra congregation prior to the team’s arrival. The friendships that grew between these brothers and sisters in Christ was an incredible thing to witness! Pastor Francis leading worship with the Sinfra church and work team. 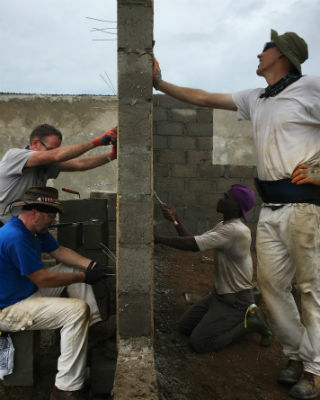 As the local congregation worked—women carrying water for the cement and cooking food, men laying blocks and carrying construction items—they interacted with the short-term team, and the church building walls went up. As the crowds gathered to see the activity, they witnessed the physical structure of the building, but they also were in the midst of brothers and sisters in Christ, from two different cultures, being mutually encouraged and challenged. It’s God who has built the church in Sinfra and, together, we have the opportunity to help the church—the people of God in Sinfra—to have a permanent structure where they can worship. A church is being built—not just a structure, but the people of God being built up! Be a part of what God is doing in Côte d’Ivoire. To partner with us financially, visit give.chogglobal.org/bjmihsill. Learn more about Global Strategy at www.chogglobal.org. This entry was posted in All Church of God, Give Life, Global Strategy and tagged Africa, Bobby and Jenny Mihsill, building project, Cote d'Ivoire, Global Strategy, growth, Ivory Coast, Missionaries, missions, the Mihsills, work teams. Bookmark the permalink.